After nearly a quarter century of civil conflict, Liberia faces enormous challenges to increase access to food and nutrition for vulnerable populations. Liberia has one of the highest maternal and child mortality and morbidity rates in Africa. Malnutrition is a significant concern due to inadequate access to food and nutrients, sub-optimal nutrition and hygiene practices for mothers and children, and limited access to quality health care. 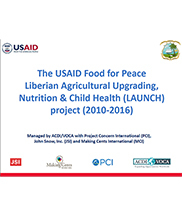 The Liberian Agricultural Upgrading, Nutrition and Child Health (LAUNCH) project was a USAID Food for Peace (FFP) Multi-Year Assistance Program (MYAP) that aimed to improve food security of vulnerable people living in the rural Bong and Nimba counties. Under this project, supplemental food rations were distributed monthly to pregnant and lactating women, as well as children under age two. The program used a PM2A approach, which is a proven approach to preventing malnutrition of children under age two. The project objectives were to: 1) Increase availability of and access to food of vulnerable rural populations, 2) Reduce chronic malnutrition of vulnerable women and children under five, and 3) Increase access to education opportunities. 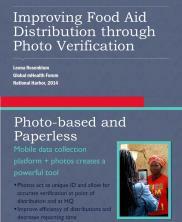 LAUNCH was implemented by ACDI/VOCA in partnership with JSI, Project Concern International (PCI), and Making Cents International. 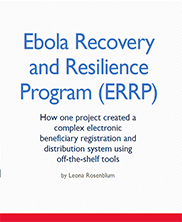 Read related blog post by Ella Jablai on A Visit to Remote Liberian Communities During the Ebola Outbreak.